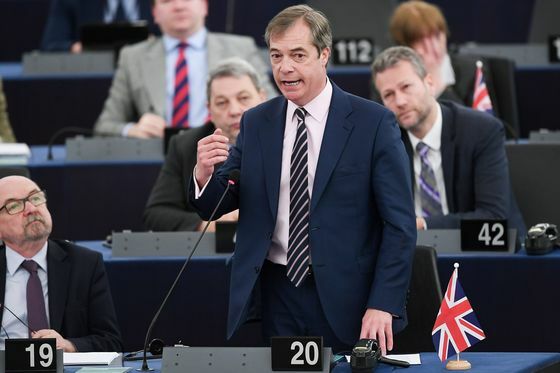 (Bloomberg) -- The European Parliament scratched century-old wounds and traded Brexit insults during what might -- or might not be -- the U.K.’s final full session in the assembly after 43 years of EU membership. 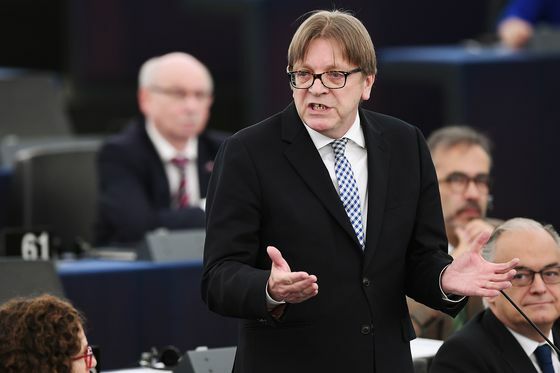 As British lawmakers prepare to vote back in London on their preferred model for the U.K.’s relationship with the bloc, Nigel Farage, one of the leading Brexit campaigners, and Guy Verhofstadt, a former Belgian prime minister, exchanged jibes in Strasbourg, France. Farage, who took part in a pro-Brexit rally on Saturday that was overshadowed by a larger pro-EU protest in London, didn’t see the funny side. Verhofstadt, the European Parliament’s Brexit coordinator, was undeterred. The British Parliament is voting on alternatives to the Brexit deal May struck with the EU in November, including keeping closer ties to the bloc and holding a second referendum. European leaders have given the U.K. until April 12 to decide how to advance. The U.K. could leave on that date without a deal if another way forward isn’t found. EU President Donald Tusk told the assembly in Strasbourg that several options remain on the table until then, including passing May’s deal, leaving without any agreement, remaining in the EU for many more months or revoking the decision to leave completely. Michel Barnier, the EU’s chief Brexit negotiator, called for respect, as he too recalled the U.K.’s wartime defense of the European continent.